The Caravan Stage Company has been around since 1970. They were a one wagon puppet show but over the years they grew to several wagons. It was started by Paul Kirby and Adriana Kelder. 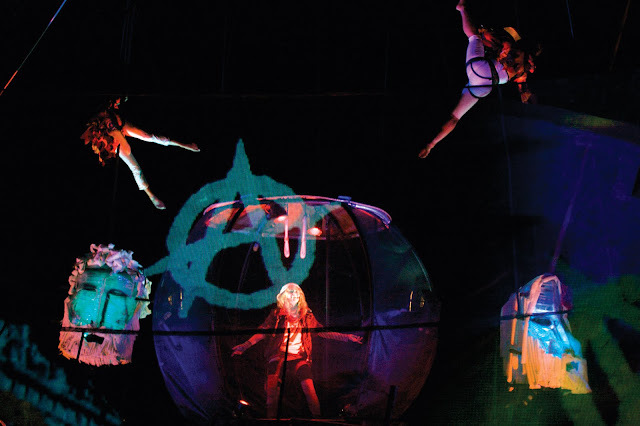 Now they have created a spectacular theatre like show that they perform on a ship deck. This allows them to be able to perform on any waterway which means that they can tour to basically anywhere as long as they have a port! This past year we were approached by them for sponsorship. They used our ivory unitards in their performance. It was a spectacular affair! The acrobats danced in the air with their beautiful outfits.They will be kicking off their 2010 tour in July and it will include places such as Croatia, Slovenia, and Italy. They are working on having dancers and large puppets for this next tour.